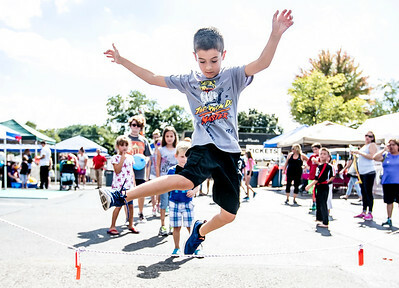 Sarah Nader - snader@shawmedia.com Anthony Gulli, 8, of Algonquin participates in a jump rope game while attending the third annual Cary Main Street Fest Saturday, Sept. 17, 2016. The event had live music, food and activities for children with proceeds benefiting local non profits as well as other chamber programs and events. 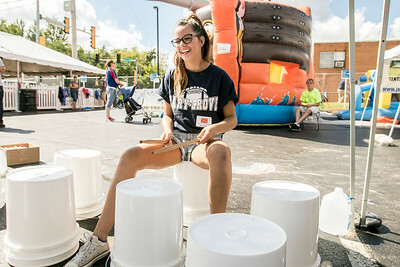 Sarah Nader - snader@shawmedia.com Volunteer Brianna Blair, 16, of Cary show children how to make noise on buckets during the third annual Cary Main Street Fest Saturday, Sept. 17, 2016. The event had live music, food and activities for children with proceeds benefiting local non profits as well as other chamber programs and events.